On December 23, 2017, at 11:10am, we lost our girl Isabelle (aka Belle). It was sudden. In the two weeks prior, she had started to avoid her food dish. We didn’t think too much of it because she was known to be finicky from time to time. Then, she stopped eating altogether and started getting sick at least once a day. First of the vet visits this December. After the second day of having what seemed a stomach flu, I brought her to the vet. Her blood work was good—liver and kidney function normal and a slightly elevated white blood cell count and a bit of dehydration. The vet gave her an anti-nausea shot, I bought some highly digestible canned food and said I would be back in two to three days if she hadn't improved. I was back within two days. She was getting weaker, having already lost about 15% of her body weight and her hind quarters seemed to be less than solid. I had the sick feeling that it would not be good news. The X-rays showed that she had a large tumour between her kidneys that was pressing on her GI tract, likely preventing her from digesting food properly and that this cancerous growth had metastasized into her lungs, which explained her increasinly laboured breathing. And then I saw it: there was just a big round ball where her heart should be. It could only be one thing: acute heart failure, which the vet confirmed. The prognosis: we could lose our girl at any time. 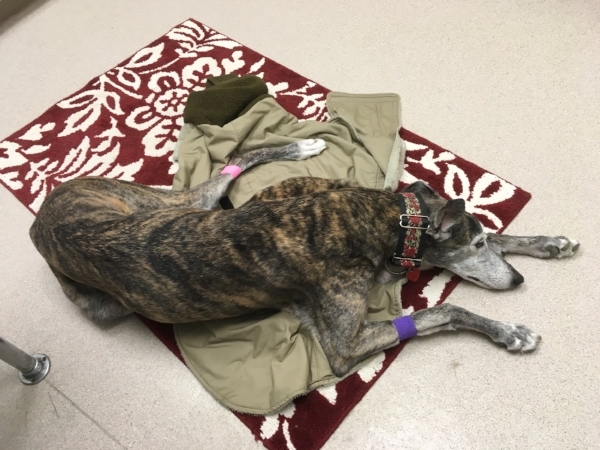 The vet gave her a steroid shot that would last 24-72 hours to help make her more comfortable, but there wasn't much else we could do that would meaningfully enhance or extend her increasingly uncomfortable life. The steroid shot, though only a temporary measure, was wonderful, giving her a some pep during her last 24 hours. She drank and went out more often and, a few hours before her last vet visit, she even accepted chicken treats from her visitor, Penney the “treat lady”, who we would regularly visit while on our evening walks. That, in and of itself seemed miraculous. Our girl went from eating nothing for the better part of two weeks to happily wolfing about a dozen treats we knew her body would not be able to handle. And it was OK because she was her happy self again and we knew we were soon going to have to say goodbye. Within an hour of her treat fest, she was gone. It was SO hard to let go, but the fact that the start to her last day had been so special made it easier to bear. Our ability to not focus on cost made it easier to evaluate interventions on their merit versus their cost. It also kept our preoccupations to a minimum, making it possible to focus on our girl and not on other worries. And the ability to do that was extremely valuable. I wish this on every pet owner. The ability to pay strips away the potential for guilt, providing greater chance for peace of mind despite the difficulties associated with what feels like an unbearable situation. While in search of a "four-legged friend," I'd Googled the characteristics I wanted in a dog and greyhounds kept popping up a breed. The night before we found out about 3 1/2-year-old Isabelle, I dreamed of a brindle greyhound female. Lo and behold, when we saw Isabelle (then known as “Etta” or “What a Sight” as she was known in the dog racing world) she looked exactly like the dog in my dream. She was the one. I never even considered looking anywhere else. Despite being aloof when she first joined our family, she slowly came out of her shell over the years, showing more and more of her personality and greater emotion. She just kept becoming a better version of herself. And, in turn, we became a better version of ourselves. We know for a fact that we’re better people and have a better marriage because of the time she spent with us. She was the embodiment of what really matters: spending time doing what you love and with those who matter the most. For her, that was going for walks, running in the backyard, cuddling and snoozing by the fireplace, and eating her favourite foods. Daily walks, including walks to Osborne Village on Canada Day and Christmas light walks on Wellington Crescent. Walks and runs at the lake where she could roam off leash with what looked like an ear-to-ear grin. Cozy nights on her couch in front of the fireplace, with her four legs often straight up in the air. Sharing bacon, chicken and steak trimmings after meals and watching her get so excited for the unexpected treats. Welcoming foster dogs into our home and watching her show them the ropes, despite her initial annoyance at having to share her space. Walking by the river and watching her delight in exploring her surroundings. Ear scratches and tummy rubs. We miss you dear girl. Thank you for everything you did for us.